Ascension with its four days off is shaping up to be the geekiest time of the year. This time I had three big events to choose from: the LinCon gaming convention, the Kontur/SweCon scifi convention and the 45th anniversary of the Tolkien Society. Tolkienians do things in nines. I decided to spend two days at LinCon on the Linköping University campus and one day at Kontur/SweCon in an Uppsala hotel, saving the Sunday for family pastimes. Here are the games I played at LinCon. And I had lots of free Nepalese tea from the tea bar! Through the Ages II (2015). This update of a 2006 civilisation builder is currently rated second-best game on the planet on Boardgame Geek. I enjoyed playing it though I found it too fiddly and counter-intuitive. Also it took six hours for three players including rules run-down and a lunch break. So it’s not for me. Biblios (2007). This is a short and sweet abstract game with cards, colours and numbers. The theme, about Medieval monks copying books, is thinly but prettily painted onto the mechanics. Innovation (2010). Another civilisation builder, though short and abstract. I taught this favourite of mine to noobs and got beaten twice even though I’ve played the game nearly 40 times. Lovecraftesque RPG (2015). In this interesting short-session role-playing game, the group improvises a horror story in the tradition from H.P. Lovecraft using cards. Participants serve as game master, protagonist and assistant game master(s). After each scene, these functions shift one step clockwise around the table, so that last scene’s protagonist becomes the game master, (one of) the assistant game master(s) becomes the protagonist, etc. We got a really good creepy story together about inheriting a closed-down Civil War veteran’s hospital that has more recently served as a mental asylum. Check it out! The PDF is only £10. Also check out the games designed by Simon Pettersson with whom I played! Star Realms (2014). Space battle deck-building game. Fun! Forbidden Island (2010). Beautifully illustrated re-make of the Pandemic co-op game aimed at kids. At the convention auction I sold Glass Road, Great Dalmuti, Province, Race For The Galaxy, Space Cadets Dice Duel, Spank The Monkey and Yahtzee. Instead I bought Sid Meier’s Civilization and The Castles Of Mad King Ludwig. At Kontur/SweCon I chatted with loads of acquaintances, old and new. I also heard interesting interviews with Guests of Honour Kameron Hurley, Ann Leckie and Siri Pettersson. Saladin Ahmed couldn’t come as planned but had sent clips of himself answering questions from con goers, which were interesting to listen to. Good academic talks too: Josefine Wälivaara about the relative absence of queer themes in scifi movies and television, and Jesper Stage about the economics of colonialism in scifi. And I bought a Lois McMaster Bujold paperback from the Alvar Appeltofft Foundation’s huge travelling used-books store. My next con will be nothing less than the Scifi WorldCon 75 in August, in Helsinki! I learned from its organisers in Uppsala that I’m very likely to be giving a talk about Scandinavian pseudo-archaeology at the WorldCon, and I’ll probably also be on some panels. Everyone around the Baltic, you need to go to Helsinki! Not because of me, but because this is an extremely rare event for geeks in the region, pretty much like the Geek Olympics coming to your home town. 2017 was my fifth LinCon and the second one without my kids — see 2016. The original roleplaying game, 1974’s Dungeons & Dragons, set the template for a hugely popular genre that persists to this day as RPGs, boardgames (such as Descent) and video games (such as World of Warcraft). The core activity in these games is to enter underground complexes of rooms and tunnels (dungeons), defeat their various inhabitants (dragons, if you’re out of luck) and steal their treasure. The player characters who do this are termed adventurers – or, by some these days, murder hobos. As you may have noticed, there are very few dungeon-like sites in the real world, and real people who behave like D&D adventurers tend to have extremely short careers. Let’s ignore the murder hobos and look at dungeons from an archaeological perspective, to investigate why they are never seen on Earth. A typical D&D dungeon is located just beyond the edge of a tract of wilderness, at a convenient commuting distance from a friendly settlement such as a semi-isolated farming hamlet. The first question for an archaeologist is whether the dungeon is inhabited by sentient living creatures. If not, it is either an animal warren (basically a very large anthill) or a tomb. Apart from magpies, animals aren’t interested in collecting treasures. So let’s look at a tomb. A dungeon is always full of treasure when the player characters reach it, which means that the tomb must be extremely well hidden and unknown to the locals. Why else would the treasure still be there? Tutankhamun’s tomb survived almost untouched because it soon got covered by the backfill from a later, much grander tomb – which was robbed at an early date. And it certainly wasn’t possible for a few adventurers to wander into King Tut’s tomb guided by a map they bought from an old fellah at the coffee house. Carter had to employ a large team of farm workers to shift dirt for months opportunistically before they found the entrance. Another possibility is that everyone around knows where the tomb is, but that it is tightly guarded, either by the authorities or by supernatural (possibly undead) beings. Since the treasure is still there, we may infer (again) that these guards make it too difficult for a few adventurers to wander into the tomb. You need an army. Archaeologists very occasionally do find treasures in unguarded tombs, and in every single case this comes as a surprise to us. Because if anyone had remembered the location of the treasure, they would have removed it a long time ago. If instead there are sentient beings living in the dungeon, then to an archaeologist it is simply a settlement site, same in principle as the nearby farming hamlet I mentioned. Archaeologists don’t classify sentients into people and monsters, into good and evil. It isn’t clear to us upon arrival whether we can in better conscience raid the hamlet, the dungeon or more likely neither. We are simply dealing with paired settlements on either side of an ecological boundary. One practices agriculture and has few other riches, the other one does not produce much food but possesses great riches. Being so close to each other, the two communities must be aware of each other and in contact. We can see that any conflicts between them haven’t wiped either of them out so far, so most likely they are economically interdependent. The hamlet probably sells food to the dungeon inhabitants in exchange for treasure. Both communities are in all likelihood highly averse to the other getting wiped out by murder hobos. Such an equilibrium proves the farmers to be too weak to rob the dungeon dwellers and the dungeon dwellers unable or unwilling to farm the land. To an archaeologist, this setup is indistinguishable from a hamlet with a nearby stronghold or monastery. If instead the dungeon’s inhabitants have only very recently settled there, it becomes difficult to explain why there is treasure in the dungeon. Did the new inhabitants bring it? Or did they defeat a group of strong tomb guardians? Either way, the dungeon is now basically an army encampment, and so again, not a place that four hobos can walk into. There is also the issue of the underground spaces themselves. Most designers of D&D dungeons have a poor understanding of their physical characteristics. Are the underground passages largely natural caves? Then they will have quite a distinct morphology that differs depending on whether it’s a limestone karst system where a stream has eroded the rock away over millennia, a talus cave where fallen stone blocks have stacked on top of each other and left spaces under and between them, or lava tubes in a volcano. Such morphology is hardly ever recognisable on dungeon maps. Instead the spaces typically seem to have been excavated by means of mining technology, which demands enormous amounts of labour and produces spoil dumps nearby whose volume is about twice that of the dungeon or mine itself. Dungeon designers rarely pay much attention to the difference between natural rock sheets left standing in the dungeon, masonry walls and wooden walls. Finally the issue of structural longevity. Archaeologists hardly ever encounter underground spaces that haven’t filled up with dirt or rubble. But there is often a sense in D&D that the dungeon is old. Since it is an open volume of air full of functioning doors and traps and hasn’t been flooded by groundwater, there must be magic at work unless someone is there to do continual upkeep and drainage work. And if, as seems to be the rule, the passages are artificial, then the integrity of the ceiling supports is of paramount importance. This is particularly true if the dungeon has been burrowed into earth or forms the basement of a masonry building. The basement of a ruinous castle quickly fills up with rubble unless masonry vaulting has been put in, and then the vaulting is likely groaning under the weight of rubble on the ground floor for which the structure was never engineered. As you can see, studying archaeology is a pretty effective way to lose the ability to enjoy fantasy literature and roleplaying games not written and designed by archaeologists. But I believe that there are nevertheless pieces of archaeological information that can be used to add verisimilitude to your game scenarios, without making them hopelessly mundane. Here are the nine boardgames that I played more than thrice during 2016. The year’s total was 87 different games. These are mostly short games that you can play repeatedly in one evening. Taluva and Carolus Magnus are a bit longer. A long game that I played thrice was Glory to Rome. All are highly recommended! Dear Reader, what was your biggest boardgaming hit in 2016? Stats courtesy of Boardgame Geek. And here’s my list for 2015. Asterisks above mark 2016 arrivals on the top list. This past weekend saw my seventh annual boardgaming retreat: 43 hours in good company at a small hotel (in Nynäshamn for the first time), all meals included. My buddy Oscar organises everything. This year we broke the attendance record, with 28 participants, mainly guys in our 30s and 40s. Before Sunday lunch I left early and went to the release event for Karin Bojs and Peter Sjölund’s interesting new book on X-chromosome haplotypes, Swedish male-line descent and genealogy: Svenskarna och deras fäder, “The Swedes And Their Fathers”. I played thirteen sessions of ten different games in Nynäshamn. To give you an idea of how popular each individual game is, I’ve included its current BGG rank. For instance, Scythe’s 10 means that right now there are only nine boardgames that the largely US-based users of Boardgamegeek.com rate more highly. And they have rated tens of thousands of games! 4 Gods (2016). Ranked 4059. Players simultaneously lay a kind of jigsaw puzzle together and put little plastic dudes out to claim land areas. Bit stressful! Ave Roma (2016). Ranked 3226. Intricate cube pusher / worker placement ostensibly about the Roman Empire. Interesting worker / initiative mechanic but little to make you care. Deception: Murder in Hong Kong (2014). Ranked 289. Mashup of Werewolf, Resistance and Clue. Good with large groups. Detective & Co. (1984). Ranked 1329. 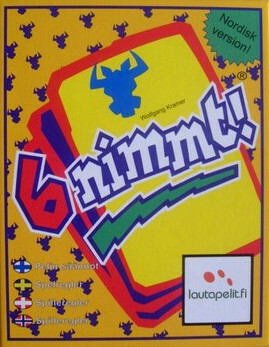 An early design by Wolfgang Kramer, who won the first of his five Spiel des Jahres awards for this game and went on to design El Grande, Tikal, 6 nimmt and many more. In the deceptively simple Detective & Co, you only know the colour of your own playing piece and anyone can move any piece around the board. Glory to Rome (2005). Ranked 117. Intricate card-based logistics game by Carl Chudyk who later released the excellent Innovation. Good fun, not too long! Love Letter (2012). Ranked 154. Minimalist card game with few components but a lot of depth. Meeple War (2016). Ranked 3381. Light and varied worker placement / war game. Pandemic: Reign of Cthulhu (2016). Ranked 639. A re-skin of the 2008 hit Pandemic, with Lovecraftian horror added. Both versions are good and you only need one. Patchwork (2014). Ranked 38. Competitive tile-fitting game for two. Elegant! This is the game I’m most keen to play again of the ones I learned at the retreat. Scythe (2016). Ranked 10. Intricate cube pusher / worker placement / mini war game in the dieselpunk world of amazing Polish military painter Jakub Rozalski. Not enough interaction for my taste. The Nynäsgården conference hotel has an interesting history that I got wind of when I used the basement service corridor. Its walls are hung with really good 1970s art prints, some of which deal with themes of Labour movement nostalgia. A senior staff member explained that the place was built as an old folks’ home in the 1920s and converted into a study-course facility by the Workers’ Educational Association in 1971. The art was donated to this organisation and was eventually sold to the current private owners along with the whole building. This stuff’s message is not what the current owners want to project (cf. the removal of the statue of the ideal working-class family from in front of Vår Gård in Saltsjöbaden), so they’ve put it in the basement. I’ve blogged before about the retreats in 2010, 2011, 2012, 2014 and 2015. In 2013 I was recovering from pneumonia and teaching my first term in Umeå, which may be why I never wrote that one up here. There’s a scifi convention in my home municipality near Stockholm this weekend: Fantastika 2016. I’m giving a talk on my Medieval castles project, and I’m also on a boardgame recommendations panel. Below is the list I’m bringing: it’s a selection of my favourites with an emphasis on the period 2010-2016. “BGG rank” refers to the Boardgame Geek web site, where lower is better. So the higher the number here, the less conventional the recommendation. To put the rankings in perspective, note that BGG covers tens of thousands of games. Plato 3000: game design by Sheamus Parkes, art by Steven Bagatzky. Spent two happy days at the LinCon 2016 gaming convention in Linköping. 1500 gaming geeks of all ages from newborn to dotage, and with a very good gender balance. The only age/gender demographic that was visibly missing was old women. But brown and black people were sadly almost entirely absent. My own main complaint though was that for the first time neither of my kids came along to the convention. This year I didn’t learn any new games, but I taught a couple and I took part (rather ineptly) in a little Blokus tournament. Here’s what I played, all enjoyable games that I recommend. Agricola (2007). Build the best farm in Early Modern Germany! Worker placement and resource management. Glass Road (2013). Build the best glassworks & brickworks in Early Modern Germany! Resource management. By Uwe Rosenberg who designed Agricola, Bohnanza and more. Caylus (2005). Build the worker’s village at one of Louis the Fair’s castle construction projects. Worker placement and resource management. Elysium (2015). Collect sets of cards under the vague pretence of constructing your own version of Greek mythology. Tobago (2009). Find buried treasure by adding successive scraps of treasure map that constrain the set of possible spots until only one remains. Kingdom Builder (2011). Settle land according to recombinant rules that make for a different game each time. By Donald X. Vaccarino who designed Dominion. Heckmeck (2005). Abstract. By Reiner Knizia who designed Tigris & Euphrates, Samurai and more. 2016 was my fourth LinCon after 2010 and 2013 with Jr, and 2015 with Jrette. Always free tea at LinCon! Here are the ten boardgames I played the most during 2014. These are mostly short games that you can play repeatedly in one evening. Only Glass Road, Qwirkle and Samurai are a bit longer. Another long game that I played a lot was Elfenland. All are highly recommended! Except Archaeology, a game of which I got tired fairly quickly – unlike its scientific namesake. I played 62 different boardgames in 2014, less than the year before because I concentrated on ones I’ve got that hadn’t seen much play. Looking back since mid-2008, the number is 216, and 19 were new to me this year. Dear Reader, what was your biggest boardgaming hit in 2014? Stats courtesy of Boardgame Geek. And here’s my list for 2013. Asterisks above mark 2014 arrivals on the top list. Here’s a neat case of self-perpetuating archaeology. Medieval history spawned sword & sorcery literature. This literature spawned tabletop fantasy role-playing games and Medieval re-enactment groups. These games and groups spawned live action role playing. And now the larpers have created a market for faux-Medieval coinage, which they are buying at game stores, using at larps and dropping here and there. 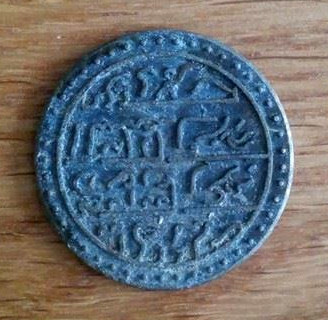 Metal detectorists are starting to find coins like the one in the picture and submitting them to intrigued museum curators. Can anybody tell me the name of the company that makes/made these toy coins? Role-playing games of the Dungeons & Dragons variety come in the form of books that are functionally analogous to computer software. You get your operating system (core rule book) and then you can buy update packages (rule expansions), programming libraries (campaign settings) and application programs (adventure modules) for it. In this analogy, the computer that runs the software is you and your gaming buddies. A difference between RPGs and computer software is that once you have a secure installed base for your operating system — that is, with RPGs, once you’ve sold enough core rule books — you can actually make more money selling new versions of the operating system itself than by developing application programs for it. Not every owner of the core rules will buy every adventure module. But every one of them will, while invested in the game, buy a new version of the core rules. I’m not sure why this is so. I suspect that it has to do with a tendency for RPG fans to spend more time reading the rules than actually playing the game. And also perhaps with a sense among them that playing with an old rule set is sort of cheating: like acting in modern life as if 19th century law were still in force. A new rule book damns the previous one to history. Anyway, this means that no successful RPG will ever stay backward-compatible for very long. My favourite RPG back in the day was Drakar och Demoner, which started out as a fairly straight translation of the 1980 American game Basic Role-Playing and its Magic World campaign setting. Its core rules went through the following swift sequence of version changes before I quit upgrading (at age 15, when I also lost my virginity — hmmm). 1982. 1st edition, “Blue Box”. 1984. 2nd edition, “Black Box”, a rewrite that left the rules clearer but functionally largely unchanged. 1985. DoD Expert, a rule expansion that could not stand alone but which replaced large chunks of the 2nd ed. rules and added much mechanics. 1987. DoD Gigant, a further rule expansion useful only to those who owned 2nd ed. and Expert. The game then went on without me through five further versions of the core rules until 2006. Looking at DoD Gigant I find that it must have been based on a misunderstanding of the basic economics of the RPG business. It’s not a sure-selling replacement for the core rules. It’s not a collection of useful expansion systems in or near the core of the system, like Expert. It’s a motley salad of rules and essays for abstruse situations that a gaming group hardly ever wanders into, or if they do, need not really be regulated by game mechanics. Much of the space is taken up by a simple strategic-scale war game. I never found a use for any of the contents. Drevgan hackar sig igenom en tegelvägg i Olofins borg. I don’t much enjoy reading game rules, and as a game master I never used them all that much. But a few years ago I ran a short adventure for two friends and my son and his buddy. All I needed for that was my copy of the 1984 2nd ed. DoD rule book. Here’s what I played. All good games! El Grande (1995). Power struggle in 15th century Spain. This is the only 1990s game currently on Boardgame Geek’s top-20, and so I wasn’t surprised to find that it was the best game I played. Highly recommended! Hacienda (2005). There was a room dedicated to the games of Wolfgang Kramer, so after El Grande we played this one of his. It’s a geometrical and abstract thing with a thin veneer of theme having to do with stock breeding in Argentina. Not bad, not great. Endeavor (2009). The Age of Discovery: find your way to other continents and establish footholds there. Another not bad, not great abstract game with insufficient theme for my taste. Power Grid (2004). Build power plants, extend your grid and sell electricity to the Germans! I’ve been playing this for years and enjoy its combination of auctions, supply-and-demand economics and on-map strategy. But don’t rush ahead: the game is designed to punish the leader throughout. Death Angel (2010). Been playing this collaborative game a lot in recent years and it’s always a hit with teen boys. Get into your power armour and prepare to clean out an evil alien infestation in the claustrophobic corridors of a derelict space ship. As usually happens, we all got eaten by the nasties. Repello (2010). Abstract game with simple rules that produce unexpected emergent outcomes. Pickomino / Heckmeck (2005). Yahtzee stripped down to its core mechanic: roll lots of dice, select a few and re-roll. A classic filler game. Its original name means “A ruckus in the frying-worm corner”, the unforgiving mathematical nature of the game having been wrapped in a kid-friendly theme involving, you guessed it, chickens enjoying an earthworm barbecue. I reported from LinCon 2010 as well.